The 16-Port PS/2-USB VGA KVM Switch from ATEN is an IP-based KVM control unit that allows local and remote operators to monitor and access up to 16 computers from a single PS/2 or USB KVM console. Up to 15 additional KVM switches can be daisy chained to the switch to control up to 256 computers from a single KVM console. Remote users access the switches over the Internet by means of a web browser using TCP/IP for its remote communications protocol. Up to 32 concurrent user logins are supported for single-bus computer access. The Message Board—a built-in feature that resembles an Internet chat program—lets users communicate with each other and exchange information in real time, allowing for smooth and efficient cooperative management of installations. 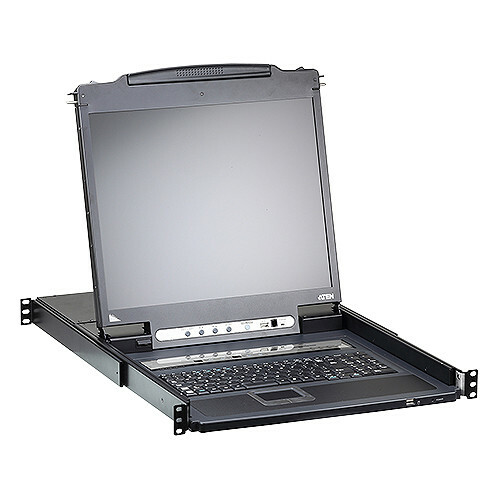 Space-saving and streamlined, the CL5716IN integrates a keyboard, a 19" LED-backlit LCD monitor, and touchpad in a 1 RU rackmountable sliding housing. The KVM section can be detached from the switch section for maintenance and repair. The security protocols supported by the switch include TLS 1.2 encryption for the browser, and RC4 128-bit encryption for keyboard, mouse, and video data transmission. For easier and more efficient user management integration, the CL5716IN also supports authentication and authorization via 3rd-party authorized servers such as RADIUS, LDAP, LDAPS, and MS Active Directory.